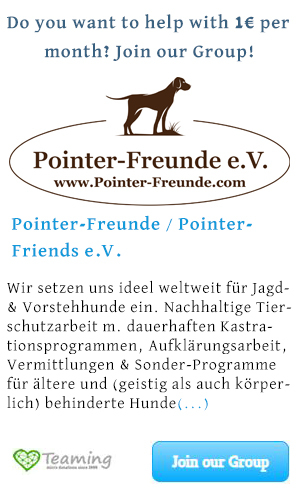 Adoption Procedures - Pointer-Freunde e.V. Has one of our pointers won your heart? You want to give a new home to one of our dogs? We are happy! To choose a dog from the animal welfare has certainly additional aspects, which must be considered, as already in the basic decision, of bringing in a four-legged friend into the family. We gladly inform you about any special characteristics or things that must be observed with the dog which you have chosen. Please contact us preferably in advance via email and tell us which dog may soon place his basket with you. Do not hesitate to call us. First of all we would like to ask you to fill-in the adoption questionnaire for us, so we can get a first hand picture of you and your personal living conditions. Certainly we will have further questions, and will be looking to make personal contact with you. You can fill in the Adoption-Questionaire or download the pdf and then also scan it or return it to us by mail. If we also have the feeling that you are the right family for our protégé we then arrange for a pre-check visit to your home. This can be carried out directly by us or by co-operating associations / organizations. Of course, we will discuss this in advance with you and arrange an appointment. By no means! Please, do not be irritated by the little word “check”. It’s a preliminary visit, where we personally want to get to know you and your living conditions. As you normally do not personally know us at this point, we do not know you either. We would like to change that. We do this for the benefit of the dog, for your own sake and of course for our “reassurance”. Often as a new dog owner you cannot so explicitly think of everything like maybe we do, as we daily have to deal with adoptions and the placement of dogs in their new families. Please do not view our visit as a control of your person or your living conditions, but as a mutual assurance that we together have thought of everything, BEFORE the dog moves in. It is always a pity whenever, E.g., a gap in the fence is only noticed after a dog has freshly moved in, it curiously explored its new territory and has slipped through this gap to the neighbors, or worse. There is no need for this and therefore, we try beforehand once again together on-site to check and discuss all the points, which possibly could be important before moving in. We would like hereby to smoothen the way to a common future for you and the dog. Option A: the dog is already in a foster home here in Germany, and you have not yet met him – then don’t waste time. He or she will be happy to get to know you soon and you hopefully also! Option C: The dog still lives in one of our foster homes or in one of our carefully selected animal shelters in another country. In this case, we will strive to book a flight and have the dog depart in a short time. We have been repeatedly asked why we are not “happy” that our dogs find a beautiful new home and why we charge a protection fee. Sometimes we are also seriously asked, if we are not happy because we have once again found a place for a dog – in such a case we “should not also take money for it”. Please, don’t misunderstand us – we have great understanding for the different views of people. Gladly we explain our view of the way we see things, for example, that of a protection fee. And it is out of question that we wish with all our heart for each of our protégés a wonderful and loving home forever. We all work very hard, to enable just that for each of our rescued dogs. Animal welfare unfortunately does not just depend on help, humanity and commitment – it also involves high costs. On the way to the new home, there are sometimes very high costs incurred: veterinary care and check-ups that have top priority with us, always cost a lot of money. Even though our contract veterinarians in the sense of cooperation and out of idealism grant us already very good conditions, they cannot work for free. In many cases in addition to the “normal” food costs we must calculate on further special foods, strengthening treatments, supplements and often meals cooked by ourselves because many of our rescued dogs are severely malnourished and must be nursed first, so that they can soon lead a carefree life, without ever again having to be hungry. It often also happens that our private foster homes are occupied, so that we have to book places in very good boarding kennels to have our rescued dogs safe and in good hands. These also have to live and cannot take care of and shelter our dogs for free. And last but not least not to forget the exit formalities and the journey itself: by plane, ship or land – there are automatically costs that must be covered. The protection fee including the travel costs is due in cash in the cases of options A and B at the signing of the agreement, latest upon delivery of the dog. If you like you can also pay by PayPal or bank transfer before picking up the dog. If the dog is not yet in Germany (option C) the protection fee including the flight costs is fully due before booking the flight upon the signing of the agreement. We cannot unfortunately book the flight prior to the receipt of payment. Before we handover a dog, it is already 3-4 weeks under our protection. During this time we get to know it better, its character, its preferences and perhaps also its weaknesses. It will be closely cared for and looked after by a vet, and of course treated with the necessary vaccinations, a chip, de-worming and treated for fleas. That way at the end of this time we can give rather very precise information about the dog and its social behavior.Also the incubation times of most diseases are by then over and we know what may be “dormant in the dog” also more precisely. Fortunately so far this has only happened in the rarest of cases during the 3-4 weeks. Usually we know at taking over / finding the dog and after the first check up (in particular of the blood) if the dog is sick. We all do not really know – all of us could have been sure, that it “will match” – with the first dog, with the other family members – with yourself. With the house cat or the horse that the dog should have accompanied on riding excursions. But what do we do when a serious problem occurs? Your husband who never lived together with a dog and now has decided to do you a favor, gets a dog from the animal welfare to give it a new home and after a few hours gasps for air looking red in the face with a rash? Animal hair allergy? A nightmare, but it can happen.Whatever happens: we are there for you! Of course after the adoption even more than before – especially when problems arise. Our protection agreement explicitly states that in these cases, the dog must be returned to our Association – it should never be handed over to someone else acting on your own or possibly delivered at the shelter. However In most cases, we will find a satisfactory solution for all parties involved.Please do not understand this as a general “right of exchange”. We are all trying to discuss as many eventualities in advance as possible, and if necessary to eliminate them. In addition we would like to ask you nicely not to immediately give up, if in the first days, it does not work out as we would have wished. A dog is a living being with its own head and its own emotions. Give it and yourself the necessary familiarization period and you will be surprised how quickly the initially alleged problems dissolve in air. Please always remember: patience, trust and love are the most important gifts you can give your new four-legged friend as a welcome! It will in most cases be thankful for all its life!